Jerry Welch is the branch manager in Ennis, Montana and runs the website Commodity Insite. Jerry Welch has been in the futures industry since the late 1970's, a true veteran of the markets. He has been quoted often in Wall Street Journal and is author of Commodity Insite, likely the longest running commodity futures newspaper columns in history. His weekly column has been published each week since the mid 1980's and is one of the most recognized names in the world of the futures markets. His column is published by the Illinois Agri News in La Salle, Illinois, Cattle Today, in Fayette, Alabama as well as Consensus, in Kansas City, Kansas. 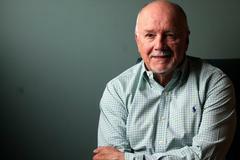 His column has been published weekly without interruption for 36 years. You can subscribe to Jerry's daily newsletter and purchase his book, "Haunted by the Markets" at his site.